SAN FRANCISCO-5-20-16 – The City-by- the-Bay hosts numerous curiosities, consistently exhibiting behaviors beyond the norm. But the most intriguing of all was a man who identified himself as Norton 1 Emperor of the United States and subsequently, "Protector of Mexico." 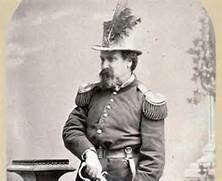 "At the peremptory request and desire of a large majority of the citizens of these United States, I, Joshua Norton, formerly of Algoa Bay, Cape of Good Hope, and now for the last 9 years and 10 months past of S.F.,Cal., declare and proclaim myself Emperor of these U.S.; and in virtue of the authority thereby in me vested, do hereby order and direct the representatives of the different States of the Union to assemble in Music Hall, of this city, on the 1st day of Feb. next, then and there to make such alterations in the existing laws of the Union as may ameliorate the evils under which the country is laboring, and thereby cause confidence to exist, both at home and abroad, in our stability and integrity. – NORTON 1, Emperor of the United States. The announcement was first reprinted for humorous effect by the editor of the San Francisco Bulletin that no doubt brought chuckles in the Newsroom as well as to the reading public. Norton would later add, "Protector of Mexico" to his title. Thus began his unprecedented and whimsical 21-year "reign" over America. He would walk the streets, "inspecting them" for any flaws and make his reports accordingly. Occasionally, Norton was a visionary, and some of his "Imperial Decrees exhibited profound foresight. 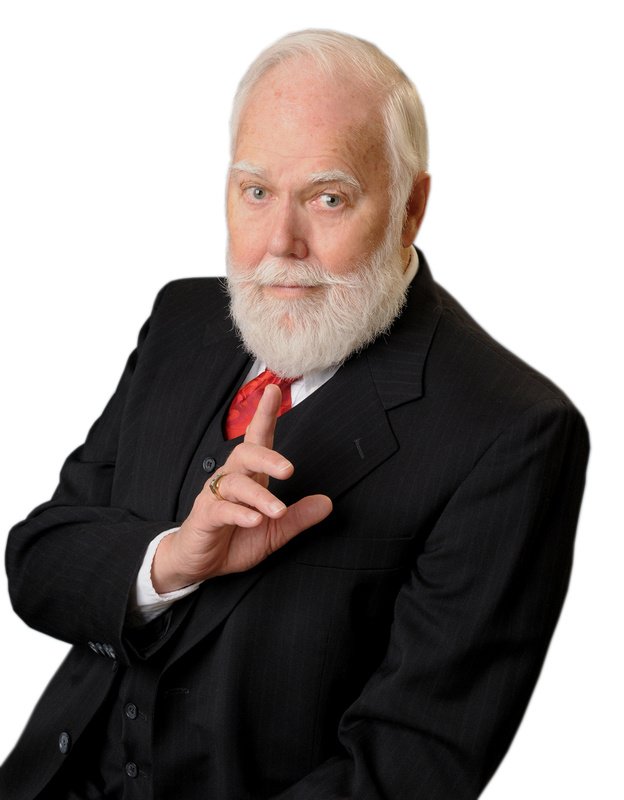 He issued instructions to form a "League of Nations," and he saw fit to decree the construction of a suspension bridge or tunnel connecting Oakland and San Francisco. He would become increasingly irritated at the lack of prompt obedience by the authorities. WHEREAS, we issued our decree ordering the citizens of San Francisco and Oakland to appropriate funds for the survey of a suspension bridge from Oakland Point via Goat Island; also for a tunnel to ascertain which is the best project; and whereas the said citizens have hitherto neglected to notice our said decree; and whereas we are determined our authority shall be fully respected; now, therefore, we do hereby command the arrest by the army of both the boards of City Fathers if they persist in neglecting our decrees. Given under our royal hand and seal at San Francisco, this 17th day of September 1872. He was very strict in titles being used properly, especially when it came to San Francisco, prompting this Imperial Decree: "Whoever after due and proper warning shall be heard to utter the abominable word "Frisco," which has no linguistic or other warrant, shall be deemed guilty of a High Misdemeanor, and shall pay into the Imperial Treasury as penalty the sum of twenty-five dollars." Over 10,000 people visited his body in state, and a huge funeral possession, witnessed by 30,000 lined the sidewalks, accompanied him to his burial plot, which is today at Woodlawn Cemetery, in Colma. 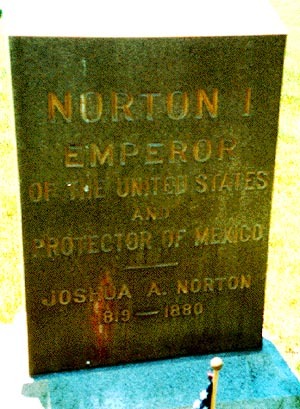 The site is marked by a headstone inscribed; "Norton 1, Emperor of the United States and Protector of Mexico." It is to be noted that the United Nations DID get formed and construction of the San Francisco-Oakland Bay Bridge began on July 9, 1933 and was completed on November 12, 1936 and the Bay Area Rapid Transit's, Transbay Tube, was completed in 1969 with Transbay Rail Service commencing in 1974. So maybe he was a real emperor after all. This entire history brings to mind the present occupier of the White House, Barack Hussein Obama. He too is a pretender who appeared to come out of nowhere, while protected by incredible security that has hidden his place of birth, college records and kept secret every facet of his early life. The difference between Obama and Emperor Norton was that Norton caused no harm to society, was colorful, and became an eccentric who was, in a way, fun to be around. On the contrary, Obama has and IS causing great harm to the United States to the point of actually working to destroy this country. Of the two, I will take Emperor Norton any day.